The SEAM360 is a safe, quick, accurate, automatic and non-destructive double seam inspection system for oil filter seams of any size. Conventional double seam testing methods that involve cutting the seam are potentially unsafe, expensive and only test a handful of points around the seam. Furthermore, due the high cost of the product, the test can’t be done often and so double seam defects can go unnoticed for hours. The SEAM360 test takes just seconds and measures seam thickness and seam height / length at every point around the seam, so bumps, cracked chucks, droops, split seams and other issues are easily picked up and displayed. Because all readings are taken automatically and the filter is rotated by the built-in motor, there’s no operator influence on the results. The SEAM360 is supplied in a lab / off line configuration, where operators manually load filters in to the unit or in an inline / robotic configuration with in and out conveyors. Using a SEAM360 for your oil filter seam tests improves quality, accuracy, tracebility and saves valuable resources. Contact Quality By Vision today for more information. 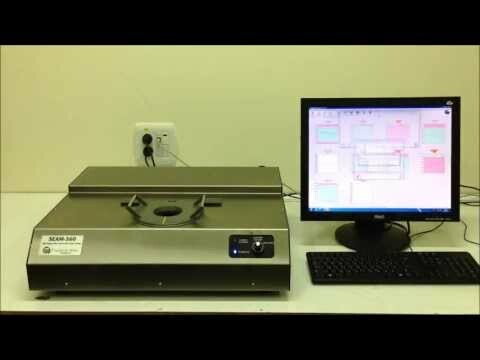 Laboratory / off-line – SEAM360 tests one filter at a time in a lab environment. Inline, continuous – Kick out one random filter every X minutes, SEAM360 tests and alerts when there is a problem. Inline, manual – Bring a box of filters to the conveyor, line them up and start the test – SEAM360 will produce a report and statistics graphs at the end of the measurement process. Inline, automatic – Kick out one filter from each seamer / seaming head every X minutes and bring them in to the conveyor – SEAM360 will test all of them and send them back to the line. Detects and locates hard to find errors that can be easily missed in a seam test, such as bumps, variations around the seam, skids, broken chucks and more!